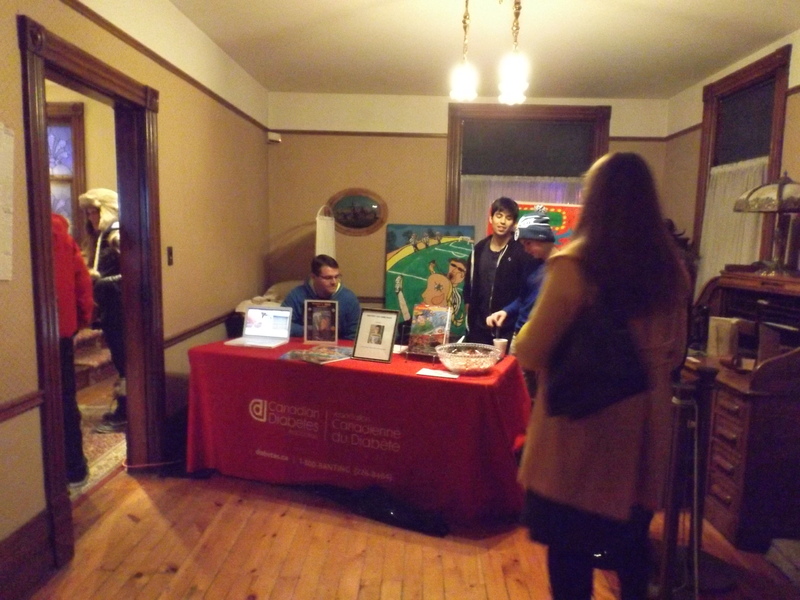 Last Friday was World Diabetes Day, and Banting House National Historic Site of Canada celebrated in style! We had just under a hundred visitors come through the doors for our afternoon Open House and main event in the evening. Grant and I went up to Sir Frederick G. Banting Secondary School in London along with our colleagues at the London & District Branch of the Canadian Diabetes Association to show support for their World Diabetes Walk and fundraising campaign. It was really great to see the student body coming together to support a great cause. We kicked things off at Banting House NHSC in the afternoon with an Open House. We had visitors from across Ontario as well as a few from Alberta and Florida! It was a little chilly with the snow, but they all seemed to enjoy their visit. It hit me again how close we are at Banting House NHSC to the disease as I was chatting with a mother who was visiting. Her son had been diagnosed with diabetes in September, and their family is still in the process of adjusting to what life with diabetes is like. She was so excited to learn a little bit more about Sir Frederick’s life and research and how the work he did with his research team has made it easier to live with the disease. While we had to move most of our activities inside due to the weather, we had a great group of volunteers who kept everything running. They helped to present a display on healthy breakfast options, ran a scavenger hunt, helped make birthday cards for Dr. Banting, and of course served cake to celebrate Dr. Banting’s birthday! 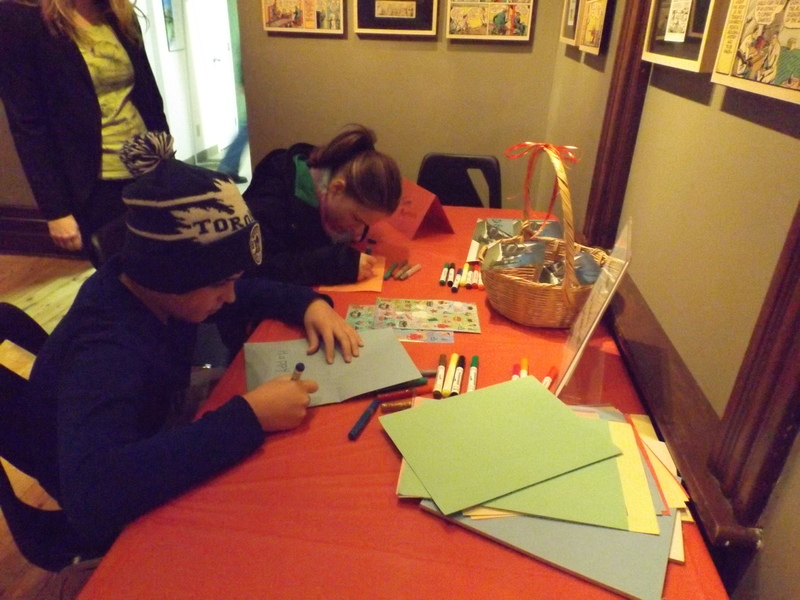 Making birthday cards for Dr. Banting! Preston Swan-Merrison was also on-hand selling his comic book, Preston’s Big Game, and raising awareness about how managing your diabetes can help you participate in all of the activities that you love. We now carry his comic book in our gift shop. Preston has generously offered to donate $5.00 from each sale to the Canadian Diabetes Association. Preston with his comic book, Preston’s Big Game. During the main presentation, Vice-Principal Melanie Seifert from Sir Frederick G. Banting Secondary School presented the Canadian Diabetes Association with a cheque for $2750.00 from their fundraising campaign! This really showed how Sir Frederick Banting’s legacy has lived on in the London community. 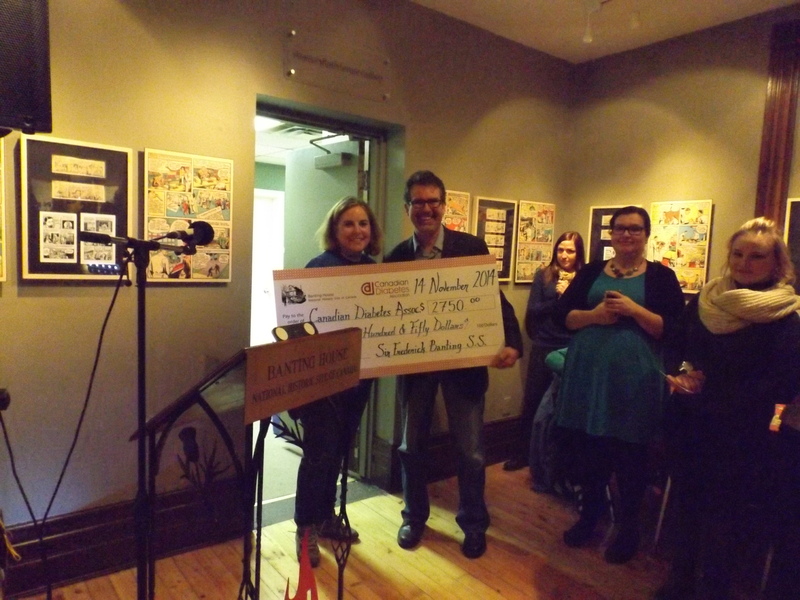 Vice-Principal Melanie Seifert from Sir Frederick G. Banting Secondary School presenting a cheque to Grant Maltman, curator at Banting House NHSC. It amazed me how much time and effort went into organizing this event and how the Banting House NHSC staff and volunteers came together to ensure that everything ran smoothly. It was great to see the dedication and support for raising awareness the local businesses and groups showed for World Diabetes Day. We’d like to thank CTV London and Weather Anchor Julie Atchison for supporting Banting House NHSC in the Blue Monument Challenge. 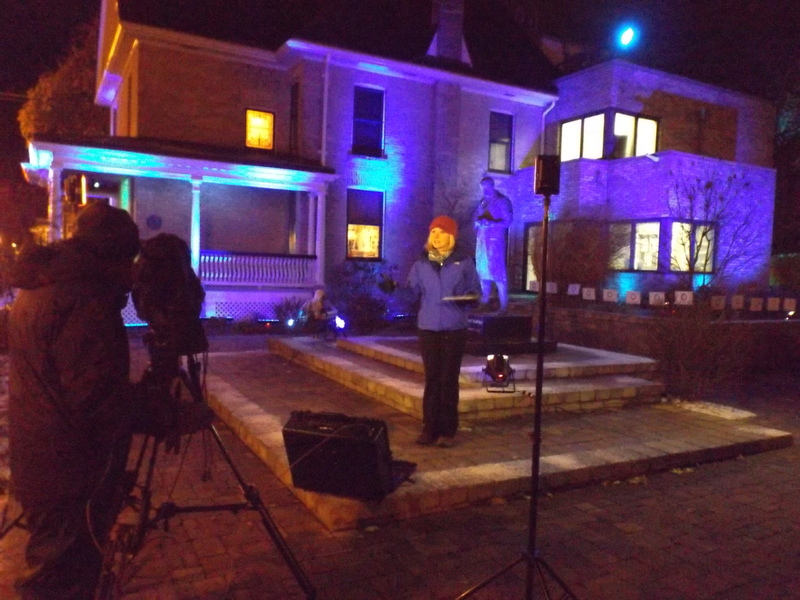 Julie Atchison from CTV London doing part of the weather report from Banting House NHSC on World Diabetes Day. We’d also like to thank Red Hott Entertainment for supplying the blue lights (which looked amazing!) and Boombox Bakeshop for donating an awesome birthday cake for Dr. Banting. Finally, thank you to all of those who braved the cold on a Friday night to come out and celebrate with us, along with those who were celebrating around the world! World Diabetes Day is an opportunity for people from all corners of the globe to come together in support of diabetes, and everyone who participated in any World Diabetes Day activities helped to show that people genuinely care about finding a cure for this disease. 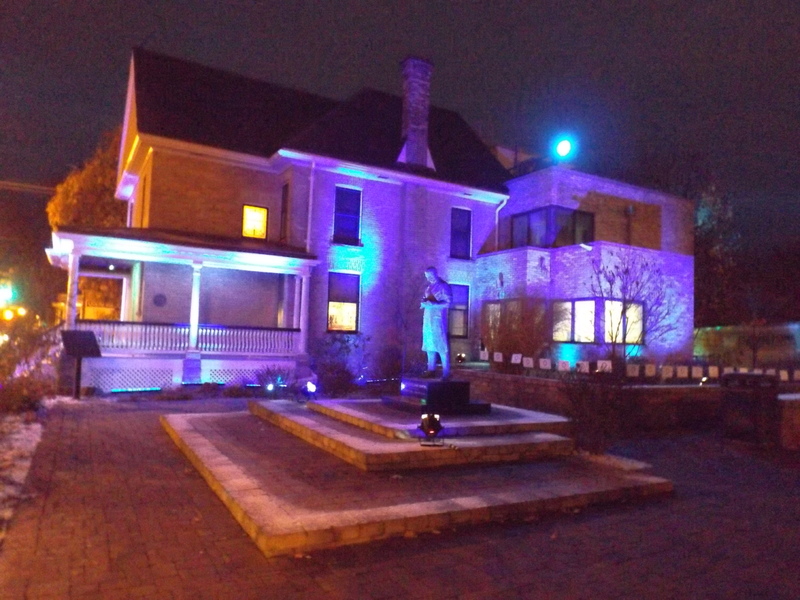 Banting House lit up in blue for World Diabetes Day. Posted in Uncategorized.Tagged Banting House NHSC, CDA, Sir Frederick Banting, World Diabetes Day. Previous Post World Diabetes Day Is Here!